Damn near impossible to put down! 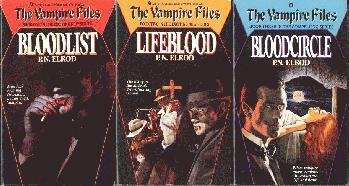 '30s-'40s Detective Noir gene-spliced with Vampire and Romance elements. Jack Fleming, ex-newspaper reporter, flees the memory of a vanished lover and New York for the streets of Gangland Chicago. He's no sooner in town when he stumbles into a Mob Boss's search for a purloined, coded blackmail list- VIA an old NY stoolie who'd preceeded Jack to Chicago. After less than two days in town, Jack Fleming winds up being beaten and shot to death by the gansters who want the list back. By the time of his execution, Jack has a concussion and cannot reveal the whereabouts of the list. The End? Not by a long shot! It seems that Jack's vanished lover back in New York was a vampire. So Jack, against the odds, didn't stay dead. And being murdered didn't exactly endear Jack to his killers, either. You get the idea, Jack's a busy guy. These stories are FUN! The characters are as real as life and the backdrop would do credit to Dashieil Hammett or Raymond Chandler at their best. The reader cares about Jack and his problems- and cheers when he uses his new-found powers to confound and confuse the bad guys. These books are a great read, folks! The illos here show the cover art for the six volumes I have, as well as a B&W of the seventh book's cover- which I have yet to see in my local bookstore. The cover art for books 1,2,3,4, and 6 that I have are by Vito DeVito and the cover art for book 5, being a second edition I think, is by Fred Gambino. I have, as of yet, no idea who did the cover art for book 7. 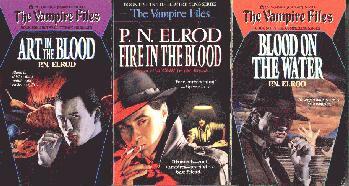 The series started in March of 1990 with "Bloodlist"and was quickly followed by June of 1990's "Lifeblood", "Bloodcircle" in October of '90, "Art in the Blood" in Febuary of '91, "Fire in the Blood" in June of '91, and "Blood on the Water" in June of '92. 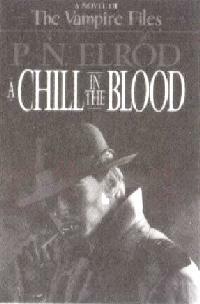 The next in the series, "A Chill in the Blood" will, I assume, be released soon in '99. I just got the copy of book 5 in mid July and the promo for book 7 was on the inside cover. I have yet to see book 7 in the stores. Rest assured, I'll buy it as soon as I do see it- this series is that good! That's all I have on Pat Elrod.